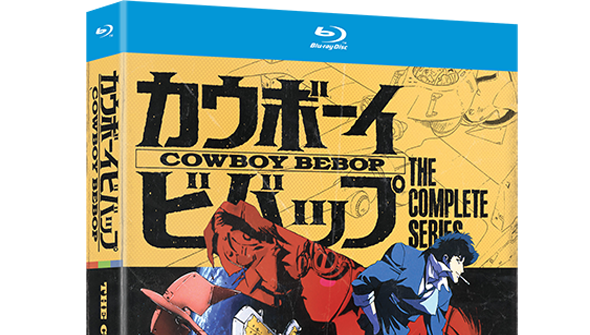 Cowboy Bebop, the now legendary sci-fi anime from Shinichiro Watanabe has finally made it's High-Def Disc début in North America courtesy of Funimation. The 1998 classic follows a group of down-at-heel bounty hunters in the 2070's as they try and make a living tracking down fugitives throughout the solar system. It's not the concept but the execution that makes it quite so good- mixing western and eastern influences to make it one of the coolest concoctions to ever grace the screens. Heavy rotation on Adult Swim in the 2000's helped it become one of the few anime series to crossover beyond the usual anime fandom, but it had been unavailable on disc in the States for some time. Following the closure original distributor Bandai, Funimation picked up the rights and now the complete Blu-ray Boxset is available Stateside at last. Limited editions were available from Amazon and Funimation but have subsequently sold out, but the standard Blu-ray/DVD combo is freely available. The series has also been re-released on DVD. Funi's re-release is reportedly up to the quality of the earlier UK release from Anime Limited, but adds a handful of exclusive extras. Funimation are also adding the series to (US only) streaming site Hulu. The first four episodes are now available both subtitled and dubbed, but the whole series is soon to follow. The entire series will be available subtitled from Friday December 19th, with the English dub to follow some time in January. Access Hulu from anywhere in the world with UnblockUs! Try it for free today, and help support AFA while you're at it!